Recording: Real-Time 30fps per channel (720fps total) @ CIF, 2CIF, and 4CIF. Dongle Cables(octopus cables for video and audio inputs, and one additional BNC output per card for Matrix). Expansion cable (to stack/piggy-back on another eDigital Hybrid DVR card). Two PCI Express x1 slots. Power consumption: 20 watts total. Operating System: Windows XP, 2000, Server 2003, Vista, Windows 7. Mac is for NVR Client only. RAM: 1GB Minimum, 2GB Recommended for 32-bit. 2GB minimum and 4GB recommended for 64-bit. 256MB minimum or on-board video graphics card. Don't use on-board graphics for more than 16 channels. 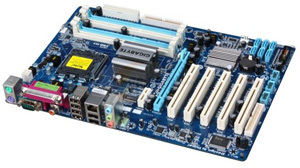 Intel 865 chipset motherboard or higher. Must be an Intel chipset motherboard. 80GB Hard Drive minimum with separate partition for OS, 7200RPM or higher. Need a motherboard? Call or email us to purchase one with guaranteed compatibility. 2 x PCI-Express (PCI-E) x1 Slot. PCI or PCI-X slot not supported.